Perforated Steel Table with two attached seats. 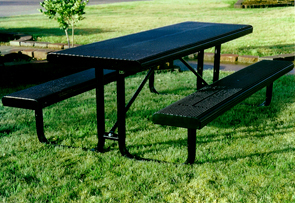 The top and seats are thermoplastic coated perforated # 11 gauge punched steel for all weather durability and have rolled top and seats for a more comfortable and stylish feel. 2-3/8" O.D. powder-coated legs for added strength. Table top and seats are available in the colors shown below in a lightly textured matte Polyethylene finish. Some assembly required.